I don’t plan on making a habit of this, but the next morning after I posted the audio piece where I perform an “Imagist” revision of Rupert Brooke’s late fragment written shortly before his death while serving in WWI, I wanted to change a few things about the mix. What’d I change? I delayed the entry of my piano part to a few bars later. I remixed the concluding electric guitar part entirely, it’s now a bit more forward in the mix. And finally I added an E-Bow electric guitar top line over the final section. Why did I make those changes? Just trying to give the piece a bit more sense of “build” as the troop ship steamed along carrying Brooke and his fellow soldiers to the disaster that would be the Gallipoli campaign. The newly added E-Bow part is probably the biggest change. The E-Bow is a clever gadget that magnetically drives a single instrument string as if it was excited by a bow. As the name suggests, it’s sometimes used to give the effect of violin or viola sound coming from a guitar—which Jimmy Page and Eddie Phillips aside, is not designed to be bowed, however I think the part I played sounds less like a orchestral violin and more like an overblown free-reed instrument. In composing the music for the Parlando Project pieces, I like using different sounds like a writer might use different images or connotative words in text. If you listen, low in the background of the mix I have a Mellotron flute part. Of course this late 20th Century instrument would not have been known to Brooke and his fellow troops, but for those late 20th Century people a low Mellotron flute part brings to mind (ear?) The Beatles “Strawberry Field Forever” or “Lucy in the Sky with Diamonds” or other English rock band recordings of the 1960s, so I was trying to bring in some sense, however anachronistically, of the soldiers thinking of home, and then at end I add that much louder, strident and free-reed sound from the E-bow guitar part. Similarly my fizzy guitar phosphorescent plankton bow-wave and electric bass thrumming ships engines. Hope it all works for you. The new mix replaces the old one as of early this morning. 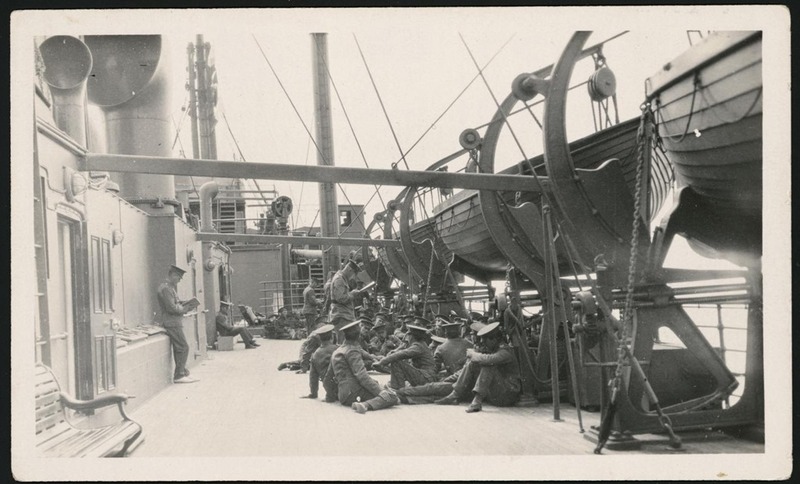 To make it easy to hear the new mix, I’ve embedded the player to hear “On the Troop Ship to Gallipoli” below. The explanation of how I revised Brooke’s words, as if he’d been edited by Ezra Pound or had lived long enough to embrace the ideas of modernist poetry, is covered in the previous post here.